All Music Home:: Our collection of music by Nigerian Artist. Upload a song or email your file. Click on a name to listen to the artist. Listen to our large collection of pop artis. Good listening time. Presenting gospel musicians for your listening pleasure. Listen to famous rap artist, including 50cents, Snoop, etc. A collection of the latest R&B; for your listening pleasure. 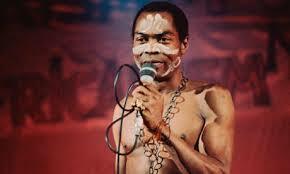 The musical style performed by Fela Kuti is called Afrobeat, which is a complex fusion of Jazz, Funk, Ghanaian/Nigerian High-life, psychedelic rock..
Highlife is a music genre that originated in Ghana in the 20th century and spread to Sierra Leone, Nigeria and other West African countries by 1920. It is very popular in Liberia and all of English-speaking West Africa, although little has been produced in other countries due to economic challenges brought on by war and instability. Highlife is characterized by jazzy horns and multiple guitars which lead the band. Recently it has acquired an uptempo, synth-driven sound (see Daddy Lumba). Joromi is a sub-genre. This arpeggiated highlife guitar part is modeled after an Afro-Cuban guajeo. The pattern of attack-points is nearly identical to the 3-2 clave motif guajeo shown earlier in this article. The bell pattern known in Cuba as clave, is indigenous to Ghana and Nigeria, and is used in highlife. .
Search for a name in the input field.